It’s been a long time since I tried a new toothpaste, but I saw a new one recently and had to get it. As I’ve said before, my big issue with toothpaste is the inclusion of sodium saccharin. It has an aftertaste that stays in my mouth long after I use toothpaste containing it. Tree-hugger toothpaste seems to be the way to go, but I always have to be sure it contains fluoride, which can be hard to find sometimes. This new toothpaste is berry-flavored. There was a grape version, but it had stevia in it, which has an aftertaste I don’t like. 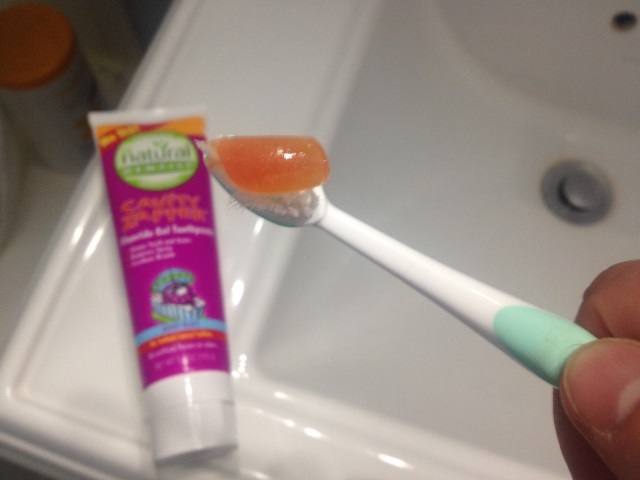 So how does the berry toothpaste taste? It has a good flavor, but a bit of sourness to it. It doesn’t foam much because it doesn’t have a foaming agent in it. I like it, but I don’t think I’ll get it again. It’s better than using a toothpaste with sodium saccharin in it, but it’s not better than my regular choice: Tom’s of Maine sweet mint gel. 1. Is that a travel toothbrush there, sir? Can you spring for a full-size some day, or do you prefer the compact handling? 2 Stevia has an aftertaste?! This is the only non-sugar sweetener I have found that didn’t have one, and it better for ya’. You have sensitive taste buds, Bud. 3. Casting aspersions on tree-huggers again, I see. Check out http://www.treehugger.com/ about news of batteries to store solar energy and take us off the grid someday (when they cost less than $3000 each). That Elon Musk – besides having an awesome name, his company comes up with out-there stuff on a pretty regular basis. 1. I’m just holding it close to the end. It’s full-sized. 2. Unfortunately, yes – stevia does have an aftertaste for me. I have not found any non-sugar sweetener that is aftertaste free. You are so brave. I can only abide mint toothpaste. Anything else and it’s just a wrong experience. Will you use up the whole tube? I will probably use it every once in a while, interspersed with my mint toothpaste. I’m not sure if I’ll get through the whole tube.